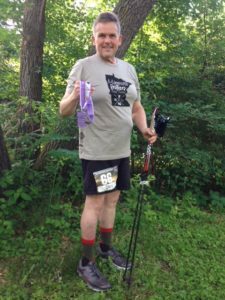 “Today I used my Nordic Walking Poles to help me finish the Jail Break Trail 10k. 1:38 finish 15:45 ave pace. I’m less then 4 months on a new hip and these really help. Nordic Walking poles can serve as your “walk assist” post knee and hip surgery. Using two poles in place of a cane or walker puts you in an upright balanced posture, supports you equally on both sides and encourages a natural stride during recovery. Be sure to check with your physician and physical therapist for when it would be ok for you to transition to poles from other support options. This entry was posted in Nordic Walking, Nordic walking benefits, Nordic Walking Technique, Poles as walk assists. Bookmark the permalink.